I don't know whether it was cool temperatures or the urge to save money before New York, but the cooking bug bit me shortly before I left on my trip. I made pasta puttanesca twice: once with the boy (who did very well for "someone who doesn't cook," as he put it), and once on my own for lunch. The Epicurious recipe I used is extremely easy and yields a tasty sauce--garlicky, tomato-y, spicy with fresh basil, capers, and olives mixed in. Yum! Since I didn't want to have pasta for lunch every day of the week, I made a different lunch to alternate with the puttanesca: fish en papillote. I seasoned white fish filets with salt, pepper, lemon juice, and paprika, then wrapped it in in parchment paper with sliced red, yellow, and orange peppers. Each packet was packed with leftover rice. With tons of fragrant fresh basil left over from the pasta puttanesca recipe, I cast about for another recipe that could use it up and came up with pesto. It sat in an airtight container in the fridge with plastic wrap on the surface for several days before I transferred it to the freezer. I finally used it as a sauce for spaghettini and chicken breast. Next time I might use it in baked chicken. Looks heartily delicious! 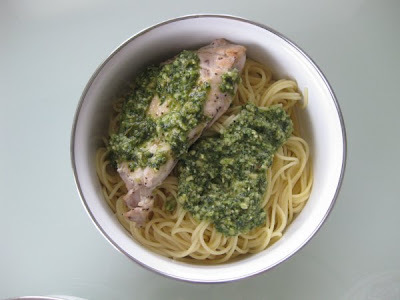 I love the taste of pesto! Omigosh, I *sooo* want to visit Solo Lisa's Kitchen! The Fish En Papillote looks yum! And yes, I also love pesto! I can eat pesto with pretty much anything. What a talented chef you are! Looks delicious! I love fish because it's so easy to cook and always good.